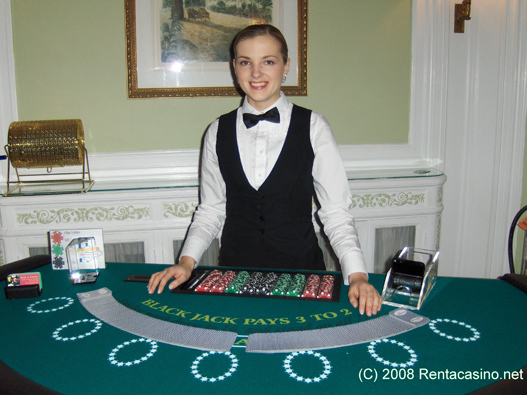 Rent A Casino offers full service casino party entertainment for client appreciation parties, corporate outings, holiday celebrations, conventions, bar mitzvah’s, graduations, reunions, fund-raisers and just about any occasion you can think of. Casino parties are our specialty. Enjoy premium casino grade gaming tables and professional, friendly dealers who will treat you and your guests like Vegas V.I.P’s. Since 1998 we’ve delivered dynamic results for hundreds of groups like yours! Only our “play money” is wagered on the outcome of the games so there is never a “financial hangover” the next day. Our dealers are much more helpful and friendly. Our planning professionals will walk you through each step of your event; starting with your first phone call. Designing the floor plan to ensure fit and flow of equipment and guests at the facility. Adjusting gaming table needs to suite your changing headcount. Delivery, set-up, and all breakdown of equipment. All authentic gaming tables - Craps, roulette, blackjack, and poler with complete accessories. Give us your complicated schedule and most outrageous demands! We’ll show you how to make it fun and memorable. Our job is to make you a guest at your event.